Community members in West Lafayette IN had a candlelight vigil and speaker's program at their mosque. 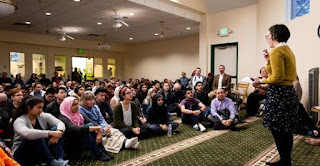 Several Muslim leaders including Muslim students spoke to the crowd of 200; the local rabbi, the mayor. And County Council Member Ilana Stonebraker, who had brought flowers on behalf of a local immigrant allies group earlier, spoke especially about a hate crimes bill in front of the State Legislature. Well received! Congratulations to Ilana.